The RDP support enabled the chocolate maker Hervé Filleul to expand his business, both in the domestic and external market. ‘Couleur Chocolat’ tripled its production in few years and today exports its chocolates to Poland, France and UK. 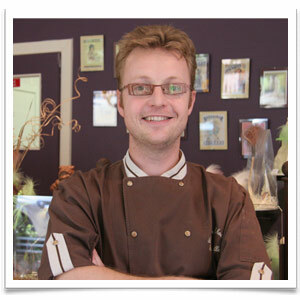 Hervé Filleul is a chocolate maker since 1999. He started his activity in a 40 square meters workshop in Thuin, a small city of 14 000 inhabitants. Since the very beginning his products were highly appreciated by consumers, but the small workroom where he was operating limited his possibilities to expand the business, both in Belgium and abroad. For this reason he decided to invest in the expansion of his workplace, moving in a larger building in a village nearby. The RDP support helped him to renovate and equipped the new building. The main objective of the project was to expand the chocolate production, both in the domestic and external market. Specific objectives were to renovate the new building, to make it suitable for the chocolate production and improve the production processes. In September 2008, a 300 square meters industrial building, located in Dontiennes, small hamlet of Thuin, became available in the market. Hervé decided to buy it and apply for RDP funding in order to renovate and equip it for the chocolate production. The building was adapted to food production and Hervé could also invest on production material, needed to expand his business. The new building was opened in February 2009. Production tripled in few year, and today Couleur Chocolat exports to Poland, Scotland and France. The company (unique in Wallonia) offers also products labelled "kosher-parve", namely chocolates without any dairy products traces and therefore suitable for Jewish consumers. Couleur Chocolate works with the Jewish communities of Charleroi, Brussels, Lille and Paris. Furthermore, the beneficiary is planning to expand into the Israeli market. According to the beneficiary, it is usually easier to start a business than to manage its development. For this reason, when implementing a business idea new entrepreneurs should not hesitate to contact people who can provide specific expertise and valuable assistance for improving the daily management of the business. The main shop Couleur Chocolat is located in Thuin (Rue ‘t Serstevens, 61), in the Hainaut province, Wallonia.